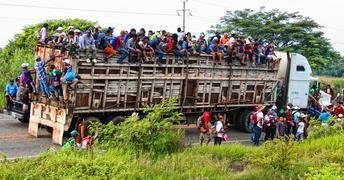 Doctors, journalists, students and farmers are among more than 60,000 Nicaraguans who have fled the country in fear of their lives since anti-Government demonstrations began last April, UNHCR, the UN Refugee Agency, said on Tuesday [16 April 2019]. © UNHCR/Roberto Carlos Sanchez | A young girl and her family apply for asylum in San Jose, Costa Rica, after fleeing Nicaragua. “I am concerned that the protests planned for later in the week may trigger another violent reaction,” Ms. Bachelet said. “Violations over the past year include the criminalization and harassment of — and attacks on — student leaders, human rights defenders, journalists and others critical of the Government. The authorities have also resorted to media censorship, bans on demonstrations, and persistent use of excessive force and large-scale arbitrary arrests by the police,” she added. The UN human rights chief said she was also disturbed by reports of conditions faced by protesters who have been detained, noting that “severe conditions” in jails could amount to torture and ill-treatment. 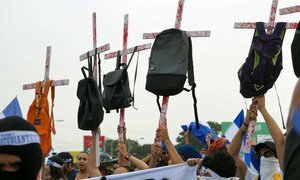 She cited recent protests at La Modelo, a men’s prison in Tipitapa, to the north-east of the capital Managua, where people were detained during the protests, who are being held alongside common criminals. The prisoners were reportedly violently repressed, through beatings, use of dogs and tear gas. (SOURCE: UN News).